With the WSOP officially less than a month away, I’m starting to log some serious hours in the lab working on my tourney game – specifically PLO MTT’s, because they tend to be a lot softer than NLHE tourneys. One of the reasons PLO MTT’s are way softer than NLHE is because there’s barely any information available in order to improve. Each week on practically every training site there’s a new NLHE MTT video created by the week’s biggest winner… Sharing the new GTO strategy that guarantees deep runs in SCOOPS and live tourneys across the globe. 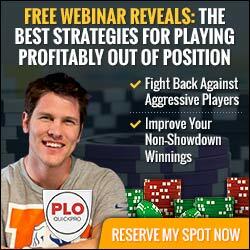 PLO is different – you have to scour the internet to find ANYTHING reliable and cutting edge. 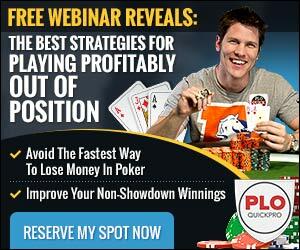 Hell, I don’t even offer anything on PLO MTT’s, and I own a damn PLO training site! This year I decided to commit to being more prepared for the WSOP tourneys and invest more into my PLO MTT game – specifically 40bb and below strategies, which is how I found Sean Kapul and his site PLOMastery.com. He’s a fellow PLO coach, a long time mid-high stakes winner on Pokerstars, and maybe most interesting was that he created the only video course created specifically for PLO tournaments that I’ve ever seen. I’ve been going through PLO MTT Mastery to prepare for the WSOP and know that I’ll have a more profitable series after learning some of the concepts that Sean teaches. He even created preflop hand charts so you’ll know exactly what to open from each position, what to 3-bet against different opening ranges, what hands to cold call, and what to defend in the blinds. By knowing the correct PF ranges, you’ll know when other players are making mistakes that you can easily exploit.I had a look at it and realized that I need to be playing a little tighter with a short stack this summer. If you want to improve your PLO MTT game in time for SCOOP and the WSOP, you’ll want to check out Sean’s new tournament courses, PLO MTT Foundations and MTT Mastery. 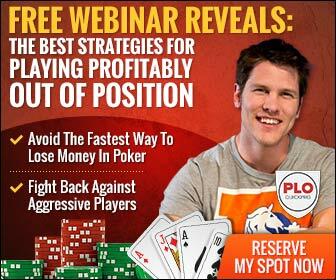 I’ve even got a special discount for you guys that want to get the course – use the coupon code “PLOQUICKPRO” and get 20% off when you get either PLO MTT Foundations or MTT Mastery. Sean told me he’s offering this discount until Friday May 5th and then it probably won’t be this cheap ever again.